A former actor and journalist for the Hollywood Reporter, Robert Osborne has died. He hosted movie introductions on TCM until a few months prior to his death. 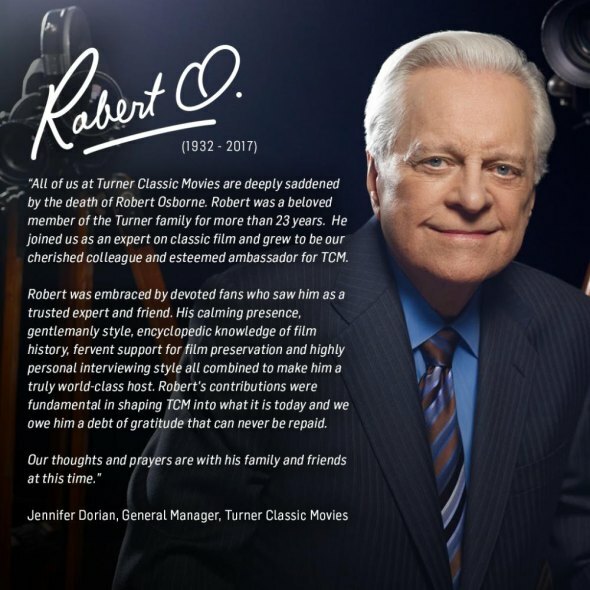 "Robert was embraced by devoted fans who saw him as a trusted expert and friend," TCM general manager Jennifer Dorian said in a statement. "His calming presence, gentlemanly style, encyclopedic knowledge of film history, fervent support of film preservation and highly personal interviewing style all combined to make him a truly world-class host." Osborne started with the Reporter writing reviews.